The meeting at Wallsend Masonic Hall was packed with every seat filled. The Worshipful Master of the Lodge, WBro John Freeman, welcomed the Officers of Provincial Grand Lodge and RW Bro Ian expressed his delight at being able to lead the delegation on such a special occasion and congratulated the Lodge on achieving 100 years. 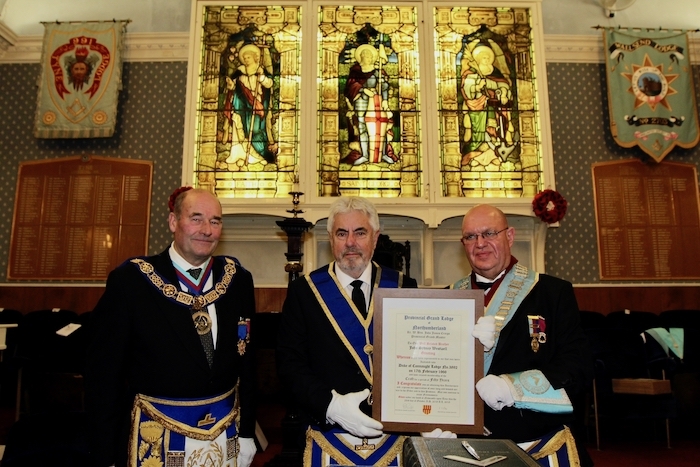 The meeting was an extra special night for one Duke of Connaught Lodge member. The Provincial Grand Master surprised WBro John Westwell, presenting him with his 50th Certificate. WBro Westwell was Initiated in February 1966 and was WM in 1973 & 1993. John now lives in Dorset and travelled up to join in the centenary celebrations but had no idea he was being presented with his 50th anniversary certificate. The Worshipful Master presented the Provincial Grand Master with a donation of £3892 to go our 2020 RMBI Festival and afterwards, at the Festive Board, the Provincial Grand Master was in for a surprise of his own when the Lodge presented him with a specially commissioned gavel to mark this special evening. Congratulations and thank you to all of the Brethren, past and present, of Duke of Connaught Lodge for a memorable night.